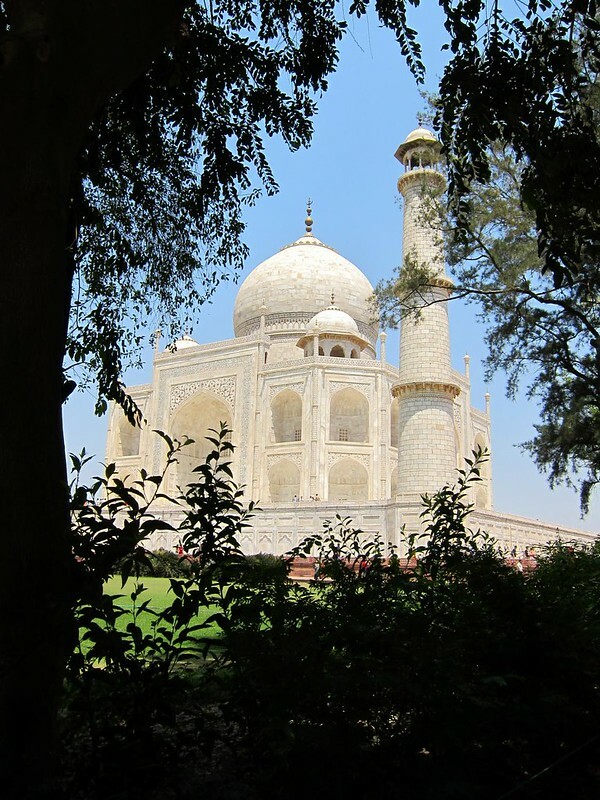 A day at the Taj… – snackettes. Built in 1632, the Taj Mahal is a symbol of the love that the Mughal emperor Shah Jahan had for his third (and favorite) wife, Mumtaz Muhal. During the birth of their 14th child, Mumtaz died, and Shah Jahan went into mourning for a year. 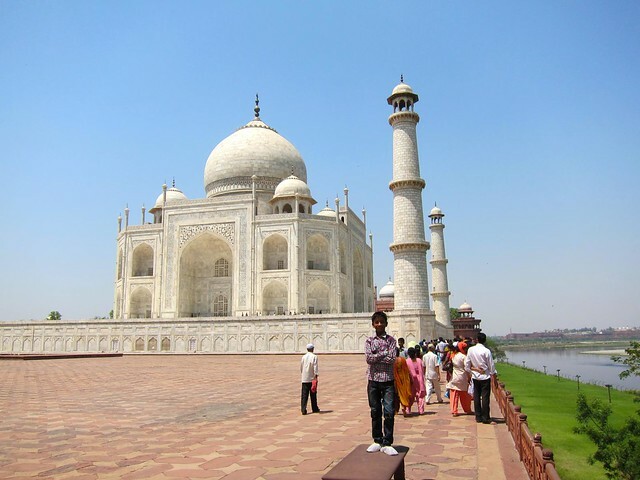 When he finally emerged, he built the Taj Mahal as Mumtaz’s final resting place. After spending so much of the empire’s money to build the Taj (and threatening to build a duplicate black version of the Taj Mahal for his own tomb! 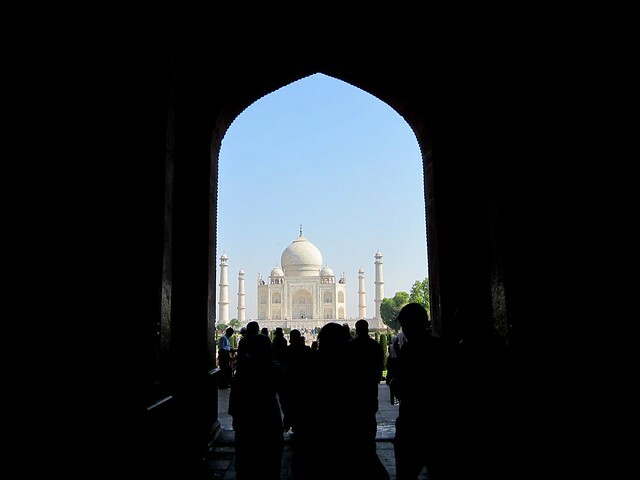 ), Shah Jahan’s son sent his father to prison in Agra Fort, where Shah Jahan was able to gaze out his prison window at his wife’s mausoleum until his death. 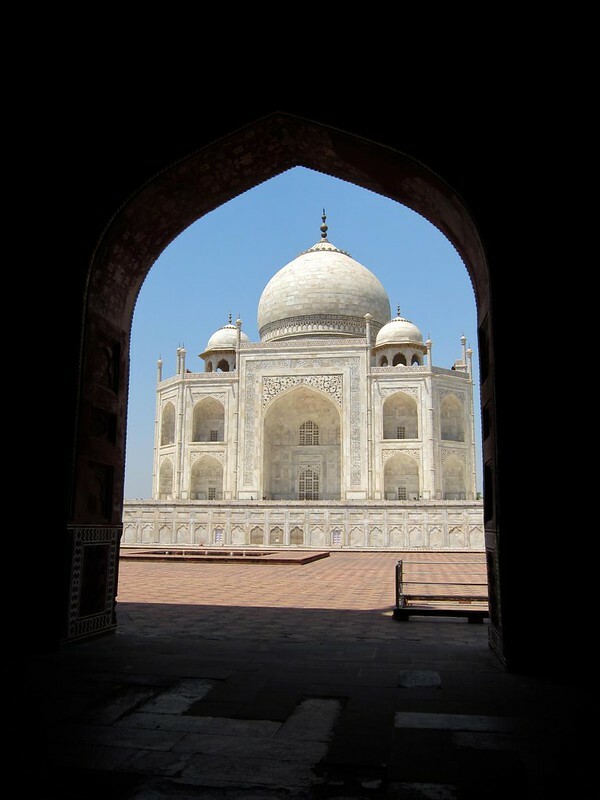 Although there were originally no plans for Shah Jahan’s body to be placed inside the Taj Mahal, his son extended him the courtesy of burying Shah Jahan beside his wife, where he remains today. 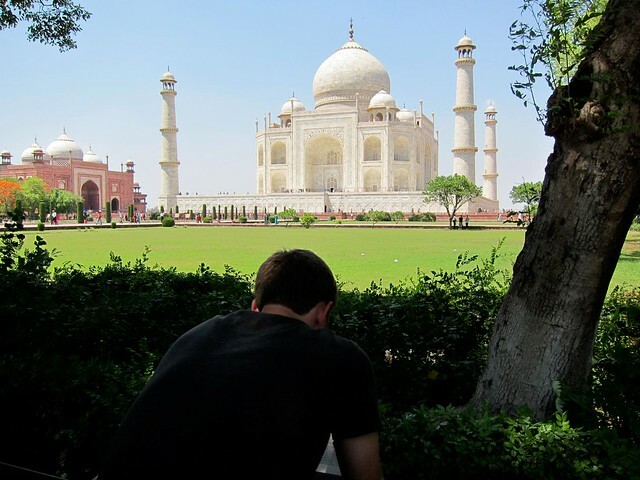 When we arrived in Agra (the city where the building is located), I was unsure whether I would really be moved by my first sight of the Taj Mahal. As we entered the courtyard and rounded the corner of the gardens, it appeared in the near-distance through an archway… and took my breath away. It was more beautiful than I had imagined. Against the perfect blue sky, it almost looked fake, exactly like the flat, hazy pictures of it that had formed my only memory of it until now. 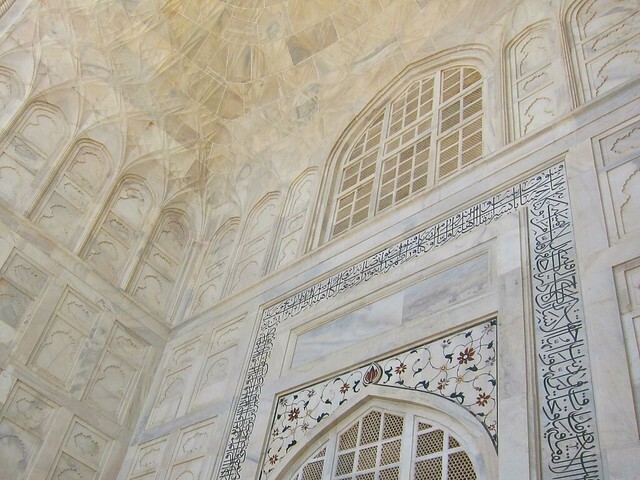 We were surprised to learn that the Taj Mahal, which is built entirely of white marble with inlaid jasper, jade, crystal, and turquoise from all over the Eastern world, is covered in black Arabic writing that depicts over 14 chapters of the Quran, some of which are read as part of Islamic funeral ceremonies. 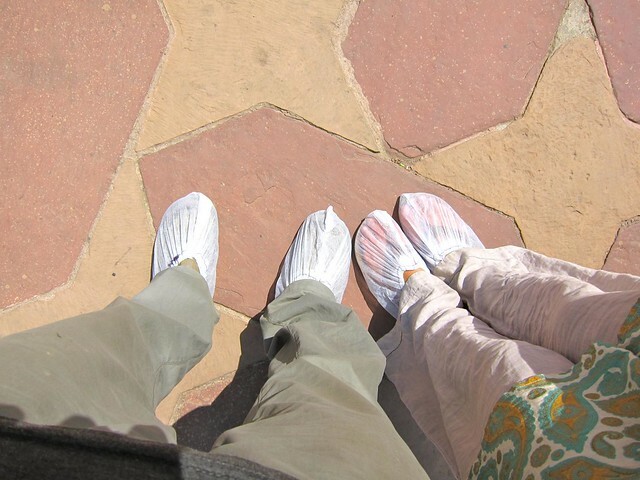 Before we entered the building, we sat in the shade of one of its minarets and listened to the audio tour that we had picked up out front. 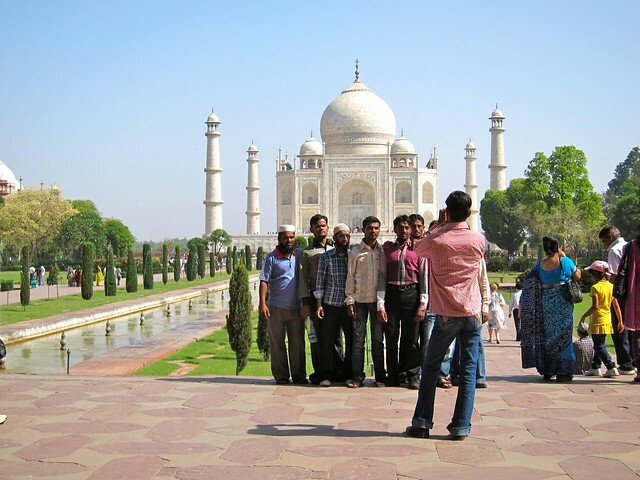 But before long, I had embarrassingly become the main attraction for other tourists at the site…. As I peacefully sat trying to listen to my audio tour, increasingly more and more people started appearing in my quiet little corner and asking to take their picture with me. One lady even placed her baby in my lap and then stood next to me for what must have been a 5-minute photoshoot! Although Scott didn’t get a picture during the peak of the craziness, we easily had 15 people gathered into the frame at one point, with at least that many more people looking on. When we entered the main mausoleum, we found ourselves in a large circular room with a large sarcophagus centered in the middle, the tomb of Mumtaz. 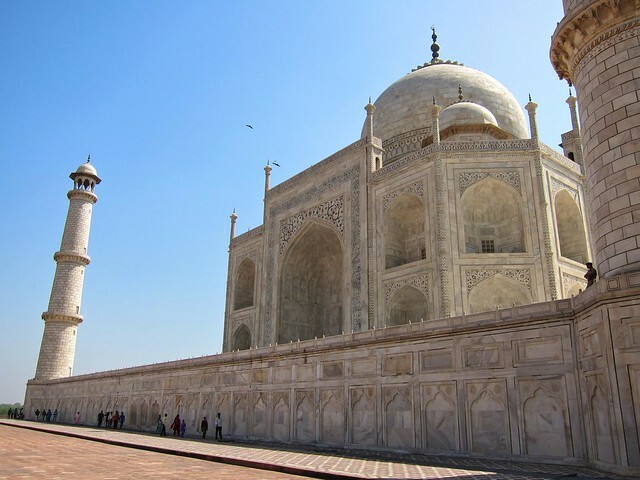 In their quest to construct a perfect building, the Mughals built the Taj Mahal to be perfectly symmetrical– and it is, save for the sarcophagus of Shah Jahan that now sits just to the left of his wife (Jahan never intended for himself to be laid to rest there). Keeping with the symmetry of the building, the only way to view the tombs is to complete a perfect clockwise circle around the lovebirds and then exit the same way you entered. 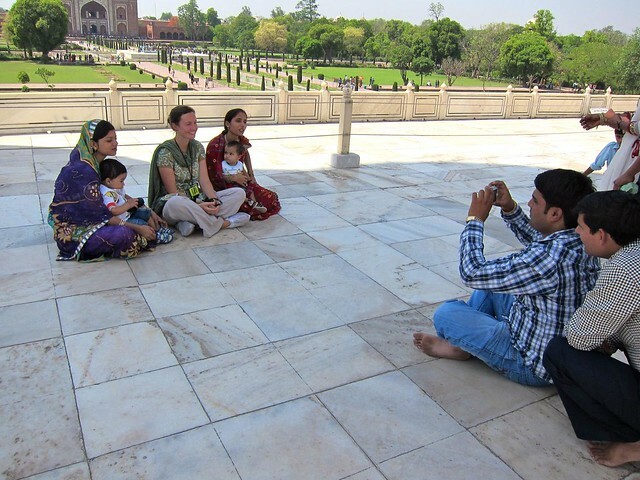 After we left the main mausoleum, we decided to simply spend the day lounging in front of the Taj. We found some empty benches, pulled out our books, and just relaxed. Of course, in typical fashion, less than 10 minutes later three Indian guys had appeared on the bench next to us and were eager for some English practice. We talked about politics, the U.S., how we liked India, what book Scott had in his hand (Rushdie’s “Midnight’s Children”)…. 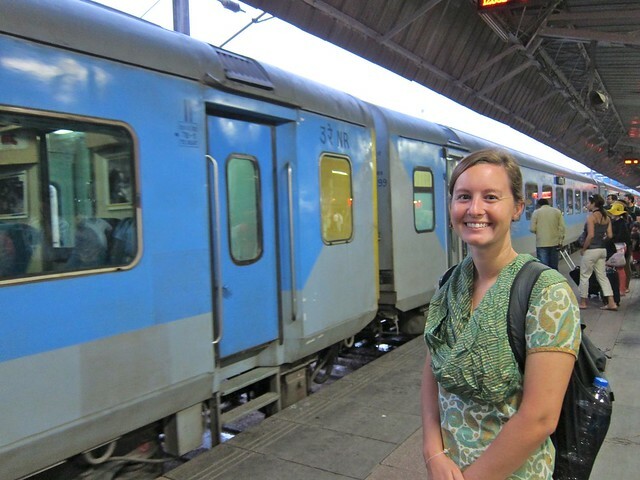 Needless to say, we didn’t get any reading done, and by 4pm we were on our way back to the Agra train station and on our way to Delhi, where we would fly to Nepal the next day. 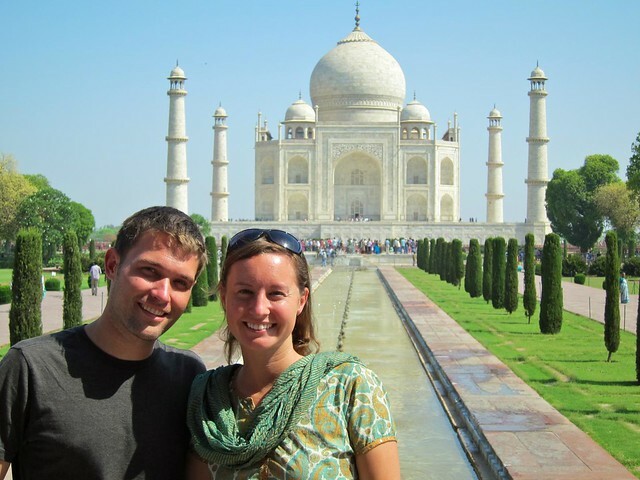 The Taj proved a magnificent way to end our 6-week tour of India, and we found it almost ironic that our last day and last morning in India were the easiest and most peaceful of our entire hectic 6 weeks there…. Now, people ask me if I’ll ever go back to India. I would go, but I have a long list of other places I want to see before I would ever consider going back. I would travel to the southern, tropical part of the country and try to find some interesting new foods to try, maybe go on a trek or two. I won’t be flying Air India though, and I won’t look forward to using the public bathrooms. India, you were a roller coaster. So long! I am so delighted that you saw this as I am a great believer in great love.